Instead of our usual pork and saurkraut for New Year's Day, my mom made traditional Korean food for New Year's. 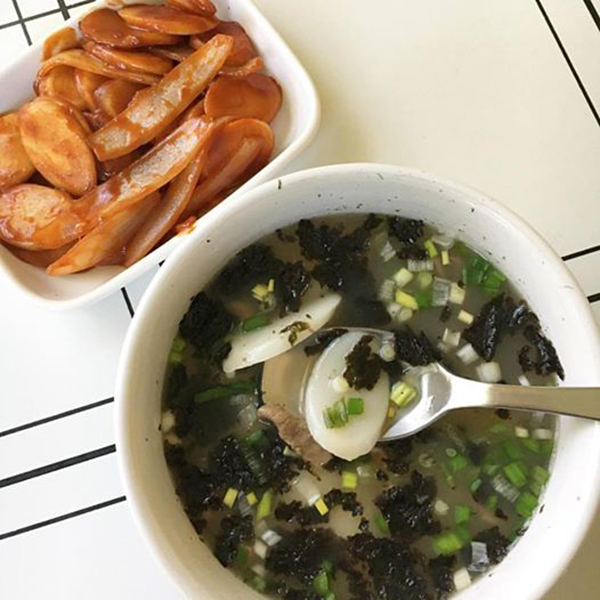 Tteokguk, (pictured at the bottom) is a soup with oval rice cake in a beef broth with green onions and seaweed added. You eat this in order to gain one year of life. Since she had the rice cakes out she also made some tteokbokki (the plate at the top of the picture) For this dish you mix gochujang which is a sweet red chili hot sauce with the rice cakes. You can also add fish cakes but I'm not that crazy about those. She added some onions instead. I like the idea of adding traditional Korean food to our New Year's meal. I've convinced my mom to teach Jackson to speak Korean and I am hoping he loves Korean food too! hi Jenny - the rice cakes are interesting - they look different from the snack-type rice cakes I'm used to. Are they homemade? Well they are sort of chewy. We got them in the frozen section of the Korean grocery store. A second language learned at a young age is priceless!